Thanks to my wonderful Beaune correspondent Allison May, I got a glimpse of just how very different March 6th was in Beaune, France and then here where I am on pretty much the other side of the world in Maui, Hawaii. 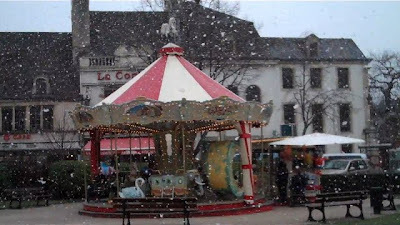 Allison was duly impressed with the tenacity of the merry-go-round operator on the Place Carnot, which was something I always marveled at as well. Come rain, wind, or as you can see here, snow, little can stop the manège. Allison also sent me this great video yesterday of the snow falling in the streets of Beaune and on the shoulders of some very disgruntled-looking Beaunois. From what I hear of my Burgundian friends and family, everyone is thoroughly sick of what has been the hardest winter in recent memory. Of course I told my long-term guests at La Maison des Chaumes before they arrived in January that winters were mild in Burgundy compared to Lethbridge, Alberta and recommended they didn’t bother bringing their snow gear. I am still ruing that day (as are they, sans doute!). And I am remaining veeerrryyyy quiiiiiieeeettt about he fact that it’s 5:30am here in Maui and I am already wearing my tankini. Enjoy, and merci again Allison! This entry was posted in Culture Shock on March 7, 2010 by admin. We are all well here and can't wait to see what this winter does to the wine. Some say it will be good for the vines? Hope so!